Your favorite COPIC and COPIC Sketch marker can easily become an airbrush with this system. Simply insert the standard broad or medium broad end of the marker into the Air Grip. The Air Grip can be hooked up to an air compressor or used with a special air can. Changing colors is as easy as switching markers. The ABS 1 Starter Set is an all-around set that can be used with compressed air or a compressor. The ABS 1 set includes an Air Grip, a 1/4" to 1/8" air hose, an Air Adaptor, an air can holder and Air Can 80 (air hose for compressor sold separately). 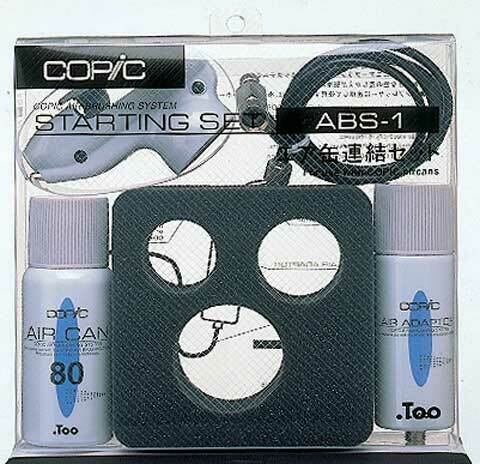 The ABS 2 Starter Set is a simple, compact set that includes the Air Grip and D-60 Air Can. The ABS 3 Starter Set is a professional set for use with an air compressor. It includes the Air Grip and Air Adaptor.